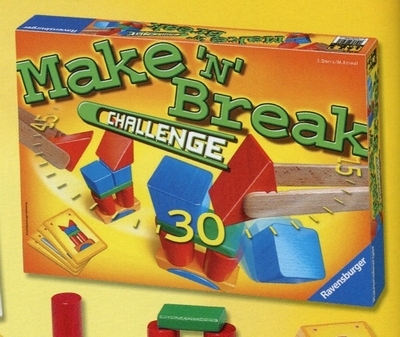 The excitement escalates with Make 'n Break Challenge! It's a tense contest between two players, where both compete for the same cards in a battle of building skills. The fastest player wins in this constant race against the clock. It may look easy, but with only a set of wooden tongs as construction tools, this game is sure to test your composure. Can you master the Challenge?! Contains: 20 wooden blocks, 2 wooden tongs, 80 building cards and a card holder. For 2-4 players. Game time: 30 minutes.